Stereographs, along with their stereoscope viewers, formed one of the most popular forms of domestic media in the 19th century. From the 1850s on, stereoscopes were available in hand-held and cabinet-style viewers. The earliest stereographs were produced by local photographers in vacation destinations, where they photographed sights for tourists. Soon, larger companies started producing sets on a variety of topics. By 1858, the London Stereographic Company could already boast of more than 100,000 different views on offer. Fictional and fantastical scenes (or tableaux) were popular, especially those that featured horror, melodrama, humour, and sentiment. Scenes from exotic locations that one might never visit also proved a hit. There were also pornographic stereographs. 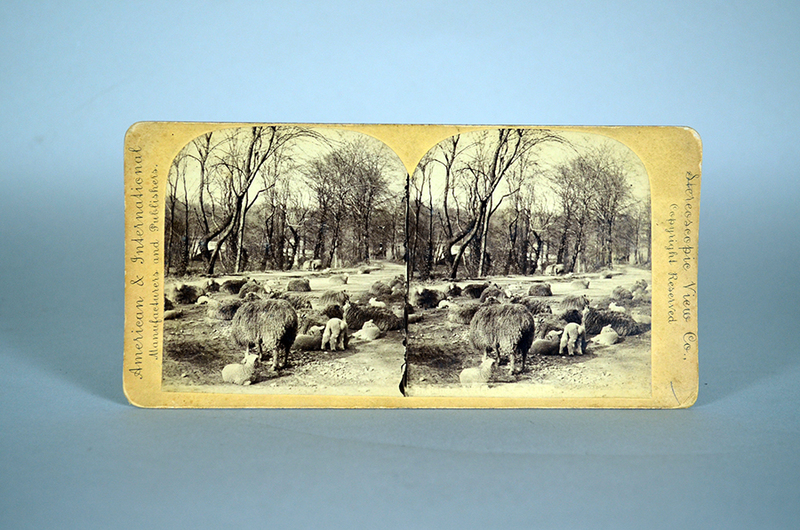 Photographers of stereographs had to ensure that the scenes they depicted did not look boring when viewed. In particular, they had to pay attention to the depth of the scene when organizing the structure of the photograph to be taken. This led stereograph photographers to produce images unlike any other produced in the field of photography. How does a stereograph work? The stereograph takes advantage of the fact that human vision is stereoscopic. Each eye views the world from slightly different locations. The pair of images found on a stereograph is photographed from slightly different positions. When the card is placed in the viewer, the right eye sees the right image, the left eye, the left image. The brain interprets the two images as one, as well as the depth of the images, which produced the “magical” impression of a three-dimensional image. You can view thousands of digitized stereographs from the Library of Congress.